Your nutritional and dietary habits influence the effectiveness of your exercise program. What and when you eat are the biggest factors. Eating too soon before your exercise program can be counterproductive to your goals and leave you feeling sick. In addition, if you don't eat properly before exercising, your body does not have a larger reserve of glucose, making it turn to your fat stores sooner. When you exercise, the muscles producing your movements call on your heart for extra blood. At rest, 15 to 20 percent of your circulating blood feeds your skeletal muscles, but during exercise this increases to 80 percent. To facilitate this change, your body constricts and dilates your blood vessels. The vessels to the unnecessary systems for exercise such as digestion, urination and reproduction are constricted, limiting the amount of blood to these organs. If you eat right before exercise, your digestive organs and your skeletal muscles fight for blood flow, making exercise more difficult to perform. Eating right before exercise can also inhibit your body's ability to use fat for energy during activity. Exercising with minimal food inside your stomach makes for the perfect combination of hormones inside your body. Your body releases adrenaline and suppresses insulin. Insulin is a hormone that prompts your body to store nutrients. Without insulin circulating in your blood, your muscles are readily available to break down and use fatty acids. Exercising on a full stomach can make you feel just plain sick. Eating a large amount of food before exercising can cause stomach pain and cramps. It may even lead to nausea and diarrhea, according to the National Obesity Foundation. 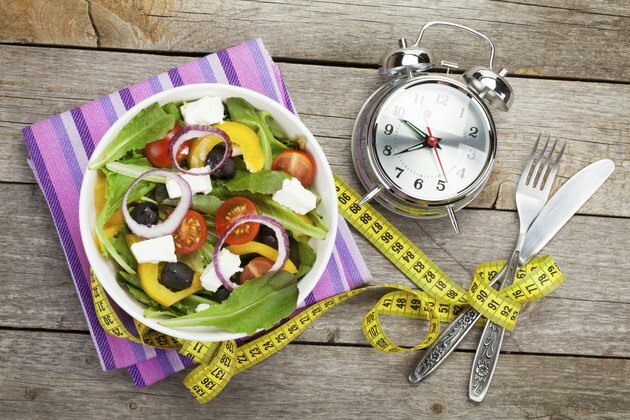 Time your meals according to when you are going to exercise. If you eat a large meal, wait at least three hours before exercising. A small meal should be followed by a wait period of two to three hours. Exercise can be followed within an hour of a small snack.